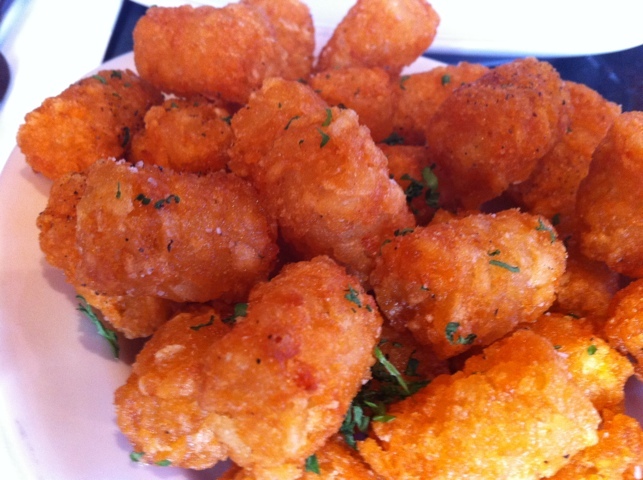 Maybe the better question is: who doesn’t like the idea of tots? 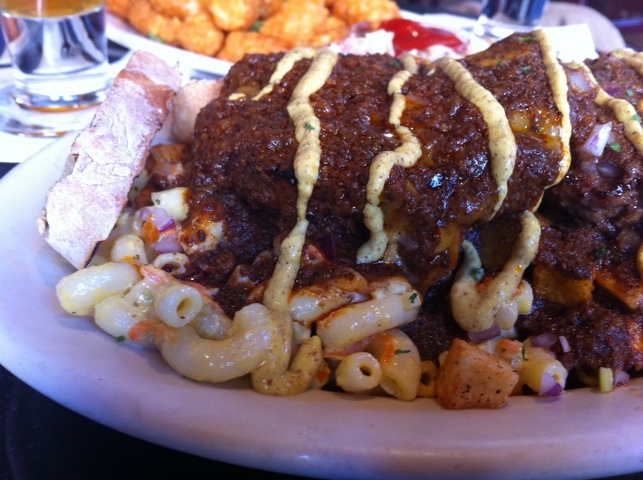 Because let’s face it – most tots you get are soggy, steamy and mushy. They are generally not the crunchy, crispy tot you were envisioning – or felt the menu promised – when you saw them on it. Tots evoke childhood, high school cafeterias and all the angst that entails. There are very few food items that whisk one back to that awkward, transitional age like a tot. Which is why finding a place that serves up tots expertly is awesome. The exterior. Doesn't really look like anything. 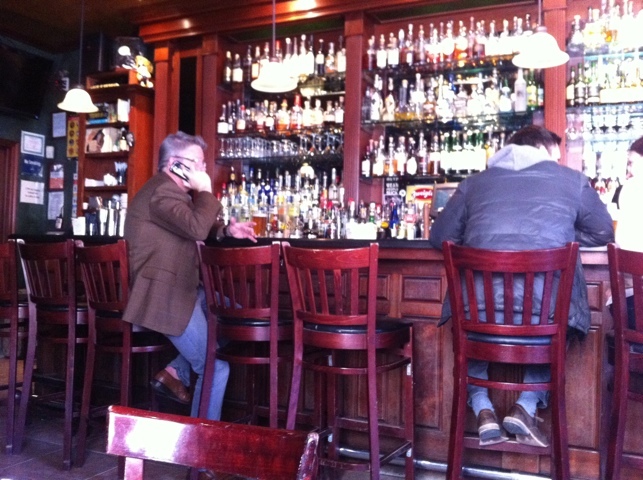 At a recent lunch in the village a friend suggested we sample what appeared to me to be an unremarkable bar. Turns out the place is called Daddy-O’s and has a reputation for, of all things, tots. This brought on one of those “I love New York” moments: step into seemingly random place, land in totopia. 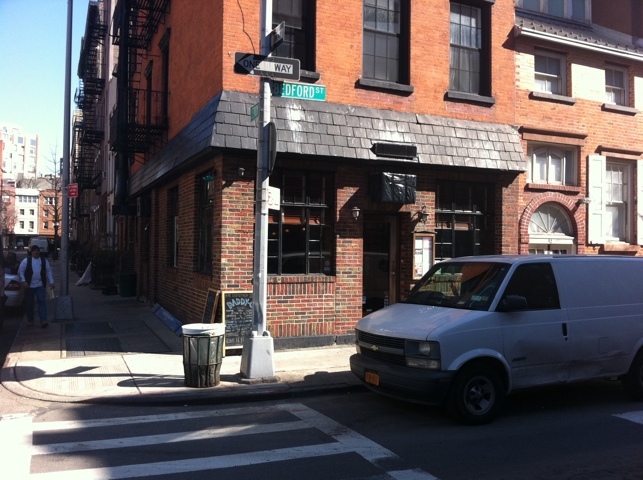 Why is it the two places that specialize in tots in NYC both have “Daddy” in their names? The other is the regrettable Big Daddy. We ordered something called “The Plate,” which seemed to me to have ten tons of food for just $14. 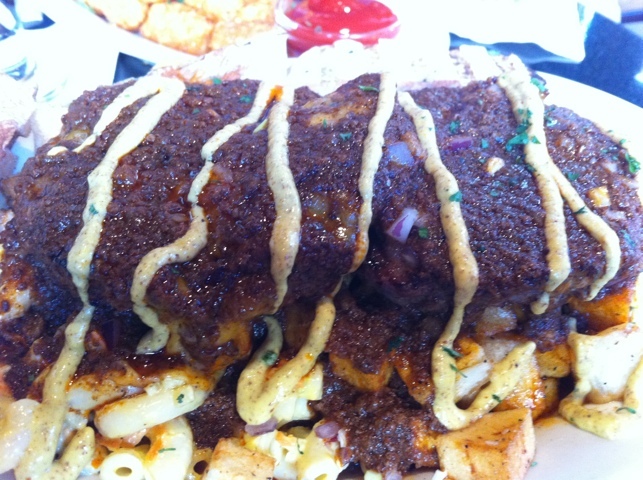 The Plate includes two burgers, macaroni salad and home fries. Sounds like enough food for two, so we opted to share it. As it turned out, the burgers didn’t come with buns, but rather smothered in a sauce with a spicy mustard striping. They sat on top of the macaroni and potatoes, like a bed. The whole thing seemed pretty messy. I should spend just a quick moment talking about the decor. As you can see, it’s a pretty classy-seeming bar, inside, lots of wood, and there’s a few tables around the exterior along the big windows. It seems dark from the outside but inside it was in fact quite, well, homey – if you’ve spent a lot of time in bars. Now back to the food. So as you can see there, the burgers were covered in a kind of a chili sauce. The chili wasn’t very spicy at all, but added the smokiness you’d expect. As you can see the whole thing was dripping with juices, which went on to create an ugly sort of lake, but more on that later. Either way, the burger was well prepared – not overcooked at all. Next time I think I’ll get it on a bun and give that a more thorough review. All in all, for a place that appeared to be a simple bar, it’s clear someone there really is thinking about the food and trying. Kudos for that. 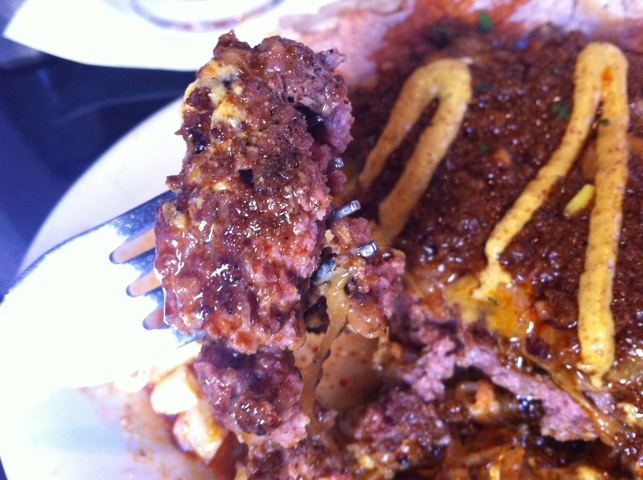 The burgers really do sit on the macaroni and potatoes. This image demonstrates well the issue with The Plate. All of those flavors wind up jumbled below. I love macaroni salad, but I am not sure I could tell you what this tasted like, because it wound up tasting like everything else on The Plate. Which is to say “not bad at all.” The smoky, slightly spicy, beefy, mustardy flavoring isn’t unwelcome. But it is a bit of a jumble. Lake Greasy Exrcretion can be found at the bottom of 'The Plate,' with islands of macaroni and potato explorable. You can see all the liquids glistening in that shot, and again, everything winds up tasting like everything else on The Plate. I’m not going to lie, the mixed pool of red grease, white runoff (presumably from mayonnaise in the macaroni salad) and so forth isn’t pretty. I am tempted to make a wildly disgusting biological simile about what it looks like, but think it’s best if I don’t and simply let the image speak for itself. After all, last time I made a biological reference in a review, one commenter took it badly. The tots, however, were served separately. They were even better than they look. 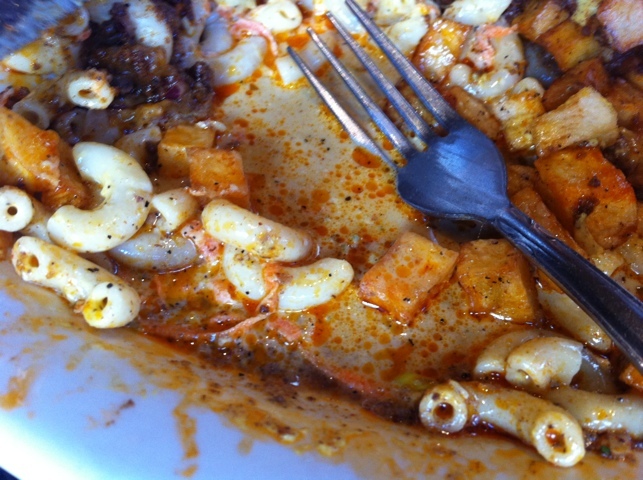 Since they were in their own plate, they did not get sopped with The Plate’s lake of juices. Hence, they were still incredibly crunchy and hot! They tasted like tots should – as in fried potato goodness that seems to almost pop when you bite into them. They have a wonderfully satisfying crunch and a decent (not overwhelming) salt. They are rich and just a little bit greasy, but just the right amount to add a slightly sinful zest. The slight parsley garnish adds a little flavor and perhaps the delusion that there might be something good for you in all this. Look, I did enjoy The Plate. It’s a tremendous amount of food for $14, if sloppy. Daddy-O’s tots, though, were the clear winner. I will be back for those tots and multibeers some time when the situation is right. Right now, they are easily the best tots I’ve had in town. College food in hipster heaven. Not mouthwatering so much as bowelwatering. Have you had a bad experience there? Not physically, but your photos make it feel like I’ve taken a bath in it.